Click the graphic above to purchase Partners in Education Celebration reservations. The Financial Literacy Advocate is selected for outstanding commitment to and promotion of financial education. 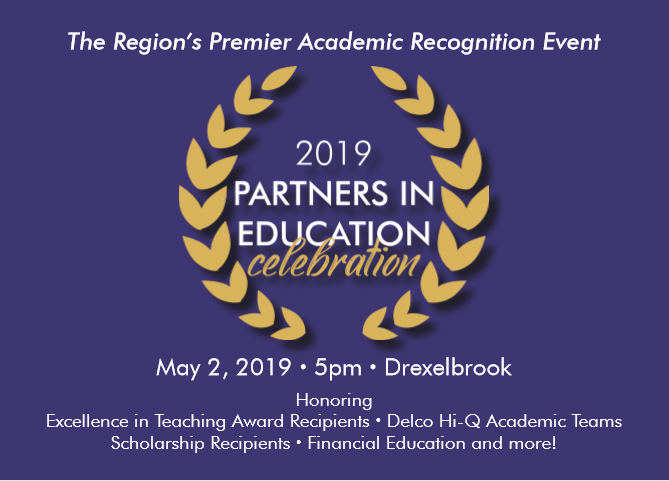 Each year a former Delco Hi-Q participant is honored for their continued academic achievement, contribution to society, and personal success. Delaware County EIT Award recipients demonstrate outstanding dedication and significant contributions to Delaware County students. This award is bestowed upon the student intern most recognized for demonstrating exceptional leadership, service, and financial literacy engagement. Five high school seniors receive a $3,000 scholarship for college. Scholarship recipients are chosen by a panel of judges considering the essays of more than 200 applicants. Honoring each Delco Hi-Q team with special recognition for the Champions, semi-finalists, most improved, and All-Delco Hi-Q Team.